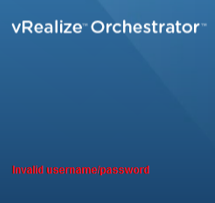 Granting user authentication from vRealize Automation (vRA) 7.2 to vRealize Orchestrator (vRO) is not as easy as it should be. I received an “Invalid Username or Password” error when logging into vRO, as shown below. My vRA environment was configured to use my home lab Active Directory (AD) domain without any issue. Next I wanted to get my vRO appliance configured. I logged into the vRO Control Center to configure the authentication and other items. Since I am using the embedded vRO, the Authentication Provider is automatically set to vRealize Automation. The custom tenant was set and I was able to populate the AD groups from the dropdown without any issues. Since I could see my AD groups, I didn’t think vRO would have any issues with authenticating any user within my selected AD group. I was mistaken. A quick search across blogs and forums did not provide much help. I went to the vExpert Slack channel and hit another roadblock. A couple members told me to follow a blog post from vCOTeam to correctly configure the domain login. I had already tried this without any success. The channel said that is how it works now and could not see much else from the logs I provided. With a bit more searching, I found a blog post on Spas Kaloferov’s blog that was my key to finding the solution to this problem, twice. 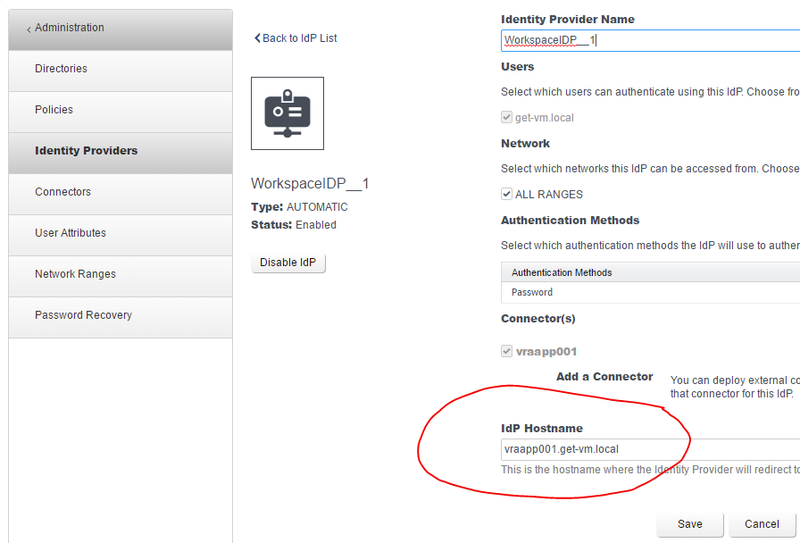 The solution that worked in my home lab was referenced under his misconfiguration of the Identity Provider in vRA. He mentions changing the IdP Hostname to the vRA Load Balancer address. Unfortunately, my vRA environment contains zero load balancers. I did notice that my IdP Hostname was not the vRA FQDN. It was set as the hostname with no domain suffix. After changing the IdP Hostname to the correct vRA FQDN, I was able to login with my AD user account. While working with a client, I ran into this issue again. Immediately, I checked the IdP Hostname. This time, the IdP Hostname had the correct FQDN configured. Later, we accidentally discovered that the certificate that was generated by one of their team members had a misspelled FQDN for the vRA appliance and lacked another Subject Alternative Name (SAN). A new certificate was generated with all of the correct FQDNs and SANs required for our deployment. This proved to be the solution for their version of this issue. VMware needs to address this finicky configuration between vRA and vRO. There are too many variables that may cause this issue. With the release of vRA/vRO 7.3, they changed the back-end authentication again and will probably eliminate this issue. However, they will create a new issue. They always do. So I’d like to say things improved in 7.3 in this regard, but it doesn’t appear to be so. (Oh and if you make changes to the Authentication Provider in Control Center and have to step away long enough for the interface to timeout or you Save Settings without actually making changes in the AP – you’ll render the interface inaccessible and will have to run a command against the appliance to reset your authentication in VRO and set it back up again! ).